The last quarter of 2016 is upon us and it is time to shed some light on what we have accomplished on Q3 and what will be included in the October release due week 41. 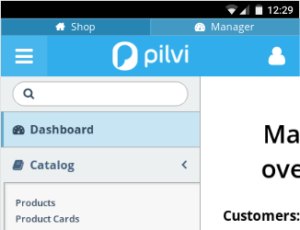 This is the first instance of the Pilvi Monthly Dev Update post. In this post I’ll go through some of new the developments that will be going live this month. It was long overdue, but we finally managed to do some polish for our UIs with help from our latest team addition Riku M. As a result we now have a full base template that can be customized with parameters to match the look and feel of our customers branding. Header has been restructured and stripped from unnecessary items. Section selection was moved from the top of the header to the left side for a more prominent view. Main navigation was moved to the Side menu. User Session related items were moved to the User menu. Side menu has been completely redesigned and is now also used in Console/Manager as the main navigation menu. User menu layout has been simplified. 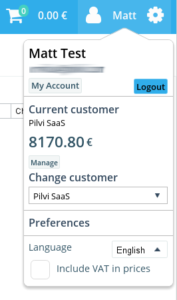 User menu now also includes User Preferences like language selection and VAT inclusion toggle. Enhancements for Responsivity. Our new base theme includes many changes to make the site more usable on mobile devices. We have also created an alternative legacy template that tries to mimic the previous look as much as possible. We highly recommend you giving the new theme a try, but in case you liked the previous look more, feel free to use the legacy theme. Let us know how you like the facelift! With the new theme that was created during the facelift we now have a more customizeable site theme. 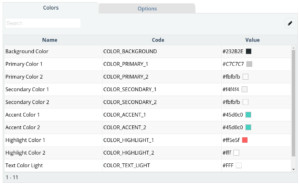 We also made some enhancements for the management of the theme colors to give you a better user experience, including a handy color picker. Product Management is something that we know have been lacking. In this release we have focused on bringing you more tools to manage your products yourselves. Product Price management is now available with various different options. Product Provisioning method can now be selected for each product. Message Center is one of the most anticipated feature we are currently working on. We have worked hard on it, but the progress has been some what slower than was originally thought. We don’t want to rush something half done, so for the October release there won’t be much to show. A lot of work has been done on the backend and this new Message Center backend will be included in the October release, but the visible changes will be minimal. We have extended PAITA to include a new Service Management API. This API can be used in combination with the Service Integration API to notify Pilvi from changes to Services. The 1.0 version support fetching and changing parameter values. These changes can affect the billing of the service if you have defined a price for the parameter. More information can be found on the our API docs.